The spare but stunning aesthetic that inspired Bering Time is evident in every design decision the company makes, from the watches themselves to the recycled and upcycle-friendly “white ice” glass jars in which they are packaged. Bering watches feature less-is-more lines, with slim profiles and clean contours. But the timepieces never sacrifice a durable build for beauty. 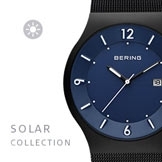 Many Bering models feature a genuine sapphire crystal at pricepoints that will stun the experienced watch enthusiast. Incredible value and crisp design are the hallmarks of Bering timepieces.